We’re so excited to announce the launch of our second online course about geospatial data in R. Sign up here. When you hear “geospatial data”, what comes to your mind? For many people, it’s ordinary maps. These are an important output of geospatial data, but it can actually be used for so much more. Geospatial data is at the heart of the big data revolution, and it’s the foundation of some of today’s biggest industries and innovations. For a long time, serious work with geospatial data required a proprietary desktop GIS (Geographic Information System), such as ArcGIS. But today R and its data visualization libraries have become powerful enough to tackle even the toughest geospatial data. 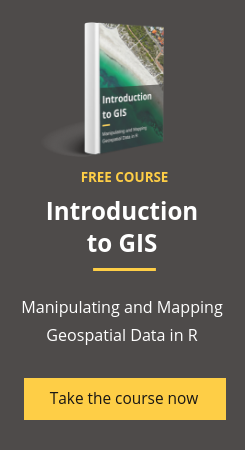 Our latest online course, Introduction to GIS: Manipulating and Mapping Geospatial Data in R, will teach you the ins and outs of how to extract, process, analyze and map geospatial data in R. Sign up now. This course is perfect for anyone who’s comfortable with R and wants to expand their skills, learn some of the latest packages, and start working with one of today’s most common forms of data. Know someone who would find this course useful? Share it with them! With the help of code snippets, exhaustive resources, and dozens of sample maps and web applications, this online course will help you learn everything from the basic “Hello World” geospatial code to in-depth analysis of satellite images with 6 in-depth lessons. What is geospatial data, where does it come from, and why is it worth your attention? In this lesson, you’ll get an overview of how geospatial data is being used today across sectors to segment markets, detect and prevent fraud, improve delivery routes, identify vulnerable populations, and more. This lesson starts with the basics — why we recommend R as a GIS, and a comparison of two common R packages for geospatial analysis. Next, you’ll walk through fundamental geospatial operations, illustrated with state-level population and economic data for India. The next step after analysis is visualization. This lesson introduces some of the most well-known R packages for creating static geospatial maps. It covers traditional visualizations like choropleth maps, as well as ones that aren’t true geographic visualizations but still convey geospatial data. Animation and interactivity are especially well-suited to geospatial data since they can show change over time. This lesson walks you through 7 different R packages for building animated and interactive maps, plus an overview of how to build geospatial web applications with Shiny. Spatial subsetting helps you tap into the actual geometry of geospatial data. This lesson explains how to filter the regions in your data based on their relation to other regions (such as a common border, distance from a certain point, intersection, and more). Raster data — or the images and data captured by satellites — is an even more complex form of geospatial data. This lesson explains what raster images are, where to get them, how to extract and process them, and what basic operations and analysis you can do on them. Absolutely nothing! You can enroll in this course for free, learn at your own pace, and access all the lessons and course materials anytime, anywhere. Ready to turn R into a lean, mean geospatial data machine? Sign up now! Is a certificate provided if one completes the GIS in R course ? Hi Adarsh, yes, you can get a certificate after completing the course. Hope you enjoy it! do you offer a certificate ones a person complete the course.